Yesterday my darling baby we sent you to chase rabbits and hopefully you will be pain free. You were loved from the first moment I set my eyes on you. Every day since March 2004 has been a gift. For that we owe a deep sense of gratitude to Bruce, Brenda and Megan for doing everything they could to save your life, and your leg. You never once complained about having to go for surgery every three days or cried when we changed your dressings twice daily. And in the last 6 months you have not once shown how much pain you must have been in as the arthritis set into you spine so badly that your good leg was no longer functioning. You had the most amazing temperament and the children have loved your kisses and good nature. You were the best ‘sister’ to Patch and she is bereft that your basket came home without you. I will miss you my nunu’s! Maxine not only had the most awful spinal arthritis which would have resulted her in not being able to walk within the next two weeks, she also had a tumour near her heart which was pushing the trachea out of position. Thank you Brenda, Megan and Chantel for taking care of Maxine and to Cottage Vets for trying all you could to see what was wrong with Maxine and especially big hugs to Megan who did the hardest thing yesterday and was there when they put you to sleep. Maxine did not recognize me when I went to say goodbye but I know she knew she was loved right to the end and she will hold a special place in our hearts forever. Oh I am sorry to hear that – always so hard, even when you know it is for the best. RIP Maxine – hope there are lots of bones for you to gnaw on where you are now. So sorry to here this Tandy! I’m glad she is no longer in pain, and probably running around chasing things. So sorry for your sad loss. 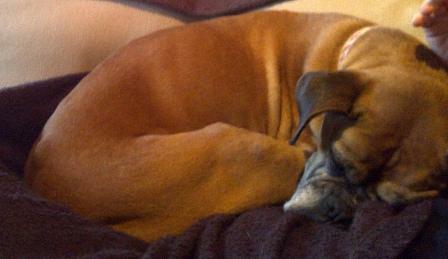 Boxers are such special dogs, we had our boxer, Benji, for 13 wonderful years. He died of a heart attack 3 years ago while running around the garden with his friends. I still miss him. So sad Tandy. Sorry that you had to suffer through this. Sending you lots of love. Oh I’m so SO sorry – I know just what you’re going through. We had to put down our baby of 10 years last year – she had a tumour in her hip and terrible arthritis, and was in constant pain and battling to walk. We lost a member of our family, and I still miss her. I’m so sorry you have to go through this. that is so sad Candice. Maxine did not once moan when I touched her back which was so amazing as arthritis is so painful! Tomatoes, granadillas, bones and rabbits. RIP, you sweet, sweet hound.